Scientists using two giant, Earth-based radio telescopes bounced radar signals off passing asteroid 2011 UW158 to create images for this animation showing the rocky body's fast rotation. The passing asteroid made its closest approach to Earth on July 19, 2015 at 7:37 a.m. PST (4:37 a.m. EST) at a distance of about 1.5 million miles (2.4 million kilometers, or 6 times the distance from Earth to the moon). The close proximity during the pass made 2011 UW158 one of the best asteroid flybys of 2015 for imaging from Earth using radar. 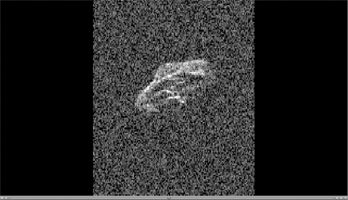 The radar images reveal that the shape of the asteroid is extremely irregular and quite elongated. Prominent parallel, linear features run along the length of the object that cause a large increase in brightness of the radar images as they rotate into view. Scientists note that the asteroid appears to be fairly unusual. Its fast rotation suggests the object has greater mechanical strength than other asteroids its size. A fast-rotating asteroid with lower mechanical strength would tend to split apart. To obtain the views, researchers paired the 230-foot- (70-meter-) wide Deep Space Network antenna at Goldstone, California, in concert with the National Radio Astronomy Observatory's 330-foot (100-meter) Green Bank Telescope. Using this technique, the Goldstone antenna beams a radar signal at an asteroid and Green Bank receives the reflections. The technique, referred to as a bi-static observation, dramatically improves the amount of detail that can be seen in radar images. The new views obtained with the technique show features as small as about 24 feet (7.5 meters) wide. The 171 individual images used in the movie were generated from data collected on July 18. They show the asteroid is approximately 2000 by 1000 feet (600 by 300 meters) across. The observations also confirm earlier estimates by astronomers that the asteroid rotates quickly, completing one spin in just over half an hour. The movie spans a period of about an hour and 45 minutes. The trajectory of asteroid 2011 UW158 is well understood. This flyby was the closest approach the asteroid will make to Earth for at least the next 93 years. Asteroid 2011 UW158 was discovered on October 25, 2011, by the PanSTARRS 1 telescope, located on the summit of Haleakala on Maui, Hawaii. Managed by the University of Hawaii, the PanSTARRS survey receives NASA funding. More information about asteroids and near-Earth objects is available at http://neo.jpl.nasa.gov and http://www.jpl.nasa.gov/asteroidwatch.